On my walk today I as usual went down the hill at the entrance to the Pyrmont Bridge and then turned right underneath the structure, heading down alongside the tourist restaurants and Cockle Bay, passing under the motorway overpasses, and alongside the shiny new office buildings to Liverpool Street, where I crossed Harbour Street on the pedestrian bridge. I entered Chinatown at the north end of Dixon Street and headed to the Taiwanese noodle shop in one of the arcades on the other side of Goulburn Street. They found a table for me and I ordered some seafood mix noodles then pulled out my mobile and started to look at Facebook while I waited for the meal to arrive. The waitress came back with my change in a rectangular blue plastic tray and I put it away in my wallet. A middle-aged, slight and slim, Chinese woman sat down in the seat next to mine but after about five minutes she moved away or left the restaurant. She probably thought a big, ungainly foreigner would make a mess of his soup. But a young Chinese woman soon sat down in the seat the other woman had vacated, and she ordered. Strangely, her food came before mine but I didn't say anything; it wasn't worth remarking on since it was a nice Sunday and I didn't want to make a fuss. I finished my noodles after they arrived and then got up and left the restaurant, walking left down the rest of Dixon Street to where the tram passes. I crossed with the green light and waited on the central island for the tram to go past on its way toward Dulwich Hill. Then I walked across and around the corner into Thomas Street, then took a right at the entrance to Paddy's Markets into Ultimo Road, I went all the way down past the UTS buildings to Harris Street and waited at the lights for the signal to turn green, then turned right and north into the main thoroughfare. Harris Street is a busy, ugly road but with gentrification there are a lot more cafes and offices along its length, despite the busyness of the main connections to the Western Distributor. So there are always pedestrians on it even though it's hardly the most salubrious of thoroughfares in the city. Frankly it could do with a bit of cleaning up. The big overpass where the approaches to Anzac Bridge lie above the street at Fig Street, where traffic comes heavily from all directions, including off the WD, is a dark and terrible place where you can imagine people getting into trouble. All sorts of satanic things. Dropped lollies. Spilled Cokes. Scattered fragments of pizza. A heel caught in a grate. But seriously, the whole business of the Anzac Bridge is a bit of an eyesore when you get up close to it. It's alright when you're underneath it in a car moving along past the Fish Market and you can see the concrete expanses fretted away into the distance across the arm of the harbour where the bridge sits. And it's ok from Pyrmont up near John Street - close to the casino - where you can look down the street and see the towers of the bridge sitting like beacons on the horizon through the jumble of highrise apartment buildings standing there. But at Fig Street you're only a few steps away from death. I was up there a couple of days ago coming home and a little group of suburbanites navigating their way toward the attractions of Darling Harbour were crossing the street dutifully. "Who's our button pusher," chimed the elderly woman, and immediately a young girl with Down syndrome rushed up and pressed the signal button. But when we got to the next set of lights, at Fig Street, the elderly woman was holding onto the girl fiercely with both hands, evidently worried about the streams of roaring traffic and all the pressing sounds of the overpass. Today I went for a walk again, down through Darling Harbour and into Chinatown, then back up Harris Street home. It had been a few days since I had gone for a walk due to the rain. We had some days of light rain - and some days of heavy rain as well - here in Sydney and I stayed inside on those days. I was also waiting for a phone call to bring me into the city to sign some papers. So today I felt really invigorated as I stretched my legs in the streets walking down on my usual route. I had also been reading the third installment of Knausgaard, which is about his childhood. I have to say that I am a bit disappointed in the way the series is taking. I so much enjoy Knausgaard's recounting of his adult life. There's something so terrible about his father in his childhood that makes you want to turn away. It fills me with a kind of despair. Not that I am comparing my childhood with Knausgaard's, but I also had a mixed relationship with my father. He was also, like Knausgaard's father, of short temper. And he let you know how he was feeling. I remember terrible anger suddenly flashing in his black eyes when we would be doing something together and I did the wrong thing. I broke the bit off a drill once and had to apologise profusely for the error, not that I meant to do it. But that was his way. He was of that older generation who meted out punishment seemingly - from the child's point of view - at random. In general I am feeling much more optimistic than I was after mum died. In those first days and weeks there was a heavy pall over everything that would not lift. Now I feel sometimes even light and happy - a happiness that can come just from seeing the faces of different people in the street - for apparently no reason at all. I think it is the exercise that is making me feel more collected, more seated in things, and even sometimes actually happy. It is making a difference in my life. I am grateful for the nagging friends who got me out of bed and onto my feet. Here I am these days stamping the pavement in the sun and even when the clouds are threatening rain. I can sometimes feel the spatter of wetness from above as the rain falls from the sky. In the first volume of Knausgaard's multi-volume series we learnt about the author's father, and the book ends with the man's funeral, by which time the author is a grown man. In the second volume of the series, A Man in Love, Knausgaard says that his father was one of the two biggest influences on his life. The other major influence being something to do with his character - "the fact that I had never belonged anywhere" - and is something that is singularly less objective and so is less replete with reality. Now, in this book, we learn about Knausgaard's romance and marriage and subsequently about his small children: there is Vanja first, then Heidi, then John. Coming second in the series you might assume that getting married and having children was a major influence on the author's life, but the book specifically tells us that this was not so. Nevertheless, the children do get their own installment in the Knausgaard series. It is written in that same relaxing, highly moderated novelistic style that we became familiar with in the first volume. There are no surprises. Nothing sticks out. The tone is even and modulated throughout to suit the reader's ear. There are a few points of tonic moment - such as when Karl Ove breaks his collar bone, near the end of the book - but these are deftly massaged back into the even membrane of the novel so that it will continue to give out a reliable, seamless tone when struck by the reader's glance. Knausgaard is reliable even when he is not always particularly original - see his word paintings of the landscape, which he says he loves so much, for example - or poetic. The language however has this tightness but it is a feeling of rightness so that the sound evoked by it is suited to the way we have come to expect throughout. And this is his achievement: to have developed a consistency of language that will allow him to communicate any conceivable event to the reader without upsetting the apple cart. Which is why people can effortlessly refer to "the Knausgaard series" without even once uttering the undiplomatic title, 'My Struggle'. We are familiar with him, and protective and loyal. We might find a theme that he develops boring or overdone but we nevertheless keep on reading to the end because after all, what else are you going to do? It's so palatable. Comfortable. Tasty. Although you do wonder how his wife sees his disquisitions on their matrimonial spats - events that happen in the book with a comfortable frequency. (He loves his readers more than he loves his wife; see how he keeps on working to satisfy our curiosity at her expense?) Love and marriage go together like a horse and carriage. If so, Karl Ove is indisputably the horse drawing it all onward. The same passivity that enables him to do more than his fair share of housework all the while that he is writing his novel enables him to write the novel in this reliable and pleasant way. His equanimity is just another sign of his dutiful and obliging nature. We are so lucky to have Karl Ove. I've been walking for over an hour each day for more than the past week. I also got a haircut, as you can probably see. The walking means I feel generally better once I get home, although I am still waking up lateish and still drinking wine in the afternoons. Nevertheless I am not feeling as depressed as I was before. In the evening when I go to bed I still read Knausgaard. I tried reading some of his second book in the series after lunch today but it didn't feel right. I preferred to turn over and get some sleep in the early afternoon. And in fact the soporific effect of Knausgaard cannot be discounted even for those who are in the best of spirits. His highly modulated, long novels of personal experience tend to make you feel like you need to yawn, pull up the covers, and turn out the light. They're comfortable and comforting. I am reminded of the time, in 2014, when I was reading books on and by Parisians. I wanted to find the ultimate book of the flaneur des rues in the city of lights. I remember reading book after book that I sourced online or through bookshops - even taking some special trips from the Coast to Brisbane to find the right choice - but never finding the exact book that would bring on the lazy sensation I have nowadays when I pick up the Kindle and tap on to the pages of Knausgaard. Or the time when I was reading only spy thrillers and crime thrillers, always hoping for that ideal book that would chew up the hours as I paced myself to turn through the pages in an effort to reach the end. Reading for me is an index of mental health. The ability in the middle of the day to put a stop to the constant appeal of social media and take refuge within the pages of a book shows, for me, a healthy mind, one in balance with the world. When you cannot read you tend to go for the chardonnay and sit with busy eyes in front of the computer, watching the stream of messages go past. I don't know what it's like for you, but that's what it's like for me. Social media distracts, that's its main reason for being. Reading a book is a far more engaged form of participation where you are forced to concentrate for long periods of time, and delay the instant gratification of the tweet or the post in the News Feed. What about you? How do you feel about the relative uses, or merits, of books and social media? I'm not talking here about news stories, magazine articles, blogposts, or journal features, but about real-life books that weigh in at on or around 70,000 words. What kind of future do books have when our lives are full of memories of dead mothers and likewise full of the blandishments of Twitter? It's been over a month now since mum passed away and I still can't shake the blues. Yes, I know that is a rather poetic way of expressing myself. What I really mean is that I'm still grieving for her. I just don't know what to do with myself. I get up now even later than before, at around 11am, and make coffee then sit down at the computer and turn it on. The reliable stream of social media temporarily nullifies the sense of nothingness that usually envelops me. I watch the messages fly past. To establish contact however usually takes some time and it all just feels that it's not worth the effort, so I don't really bother. I might add a message here or there half in the hope someone might respond but always sure that it's pointless. The morning creeps on and then I go out to get something to eat at midday or thereabouts. I might go to the sandwich shop to get a chicken schnitzel roll, or I might go to the sushi shop for a couple of packages of sushi. Either way, lunch is soon over and I am soon enough back at a loose end. If I am feeling really creative (maybe the warmth in the sunshine today provoked those creative abilities in me, you never know) I might do a blogpost talking about how depressed I'm feeling. This will be a highlight of the morning, but only if I'm so inclined. Usually straight after lunch I go back to bed. Or like yesterday I might crack open the wine and start drinking before 1pm comes around. In the evenings after dinner I will watch the news. It will be something like 6pm ABC News 24, 6.30pm SBS World News, 7pm ABC News. Then whatever the evening throws up (I mean on TV haha). Mostly I will alternate between social media and the couch, depending on the quality of the viewing material, but except for Monday night it's actually pretty ordinary fare. Monday is good; you have Australian Story then 4 Corners, then Media Watch and then Q and A. Only on Mondays do I make it long enough to watch Lateline on the TV. Then shower and bed, with a 30-minute break to read before dropping off into oblivion. That's the blessed state! Oblivion. When you don't have to think or worry about what to do or feel crap because of this deep sadness that envelops you in its drowsy clasp. This sense of loss. I wonder if mum ever thought about what it would be like for me after she went. Not while she was alive. She was too upbeat for that. But it's very true: my mother was a very positive person usually - except for those weeks after dad died in 2011 when she refused to get out of bed at the usual time. Anyway she would have commiserated with me briefly and reflected on that period in her own life, but she would have quickly passed over this problem to focus her attention on something else. Something full of life. Something alive. This book of early fiction by this Australian author contains many subtle beauties. 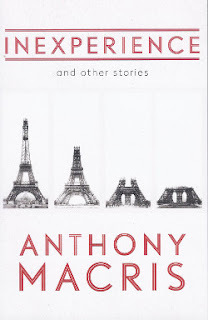 The title story, which takes up most of the space in this collection, recounts a trip to Europe by the narrator and Carol, his girlfriend. They are Australians trying to escape the mundanity of suburban existence. They are very young and inexperienced. In Paris they meet a number of different people whose attitudes to life tell us a lot about who our protagonists are. These are amusing scenes full of complex ideas. In fact, the entire story constitutes a sophisticated inquiry into the nature of being. Who am I, the protagonists seem always to be asking. Who are you? It seems like ages ago since those days. We all survive this kind of existence at one point in our lives or another. We strive to make sense not only of what we see around us, but of our very selves, and this striving has something heroic and beautiful about it. There is something elemental about the lives Macris' two protagonists live as they make their way in foreign countries. Strangely, we miss out on two years of the narrator's life in the UK, and after Paris suddenly he is on a plane back to Sydney. In Thailand he decides not to leave the plane, and sits staring out through the window at the night. Then suddenly the story takes us to the Bankok stopover on the "out" trip. It's a short chapter. The narrator and Carol are sitting in a cheap restaurant in a shopping centre and they are surrounded by the sounds and smells of a strange place. They are happy in a way that perhaps they will never be again. There is something so evocative about this short chapter, with its stacks of cheap T-shirts and its sticky plastic table cloth. In this interim zone between home and abroad, the narrator and Carol find their natural environment and a kind of settlement that will possibly elude them ever afterward. For while the notion of "Australianness" is important in the book it is essentially a story about this relationship between two people. When Carol starts to withdraw, the narrator feels things start to slip out of his control. The rest of the journey will be more problematic than the stopover in Bangkok on the way "out". The narrator is about to learn something important about himself. The title story is long but wonderful in strange ways, and the other stories each also have things to offer the reader. There's 'The Nest-Egg', a Dostoyevskian contemplation on mortality that takes the reader on a thrilling ride through modern consumer culture. Then there's a diptich, 'The Triumph of the Will' and 'The Quiet Achiever', which focus on a man living in the suburbs of one of Australia's big cities, and tracks his progress from proprietor of a failing business to being a resident in an institution. It is not a pretty story, but again Macris is in such cool control of his material that you are entertained past worrying about the fate of the main character.